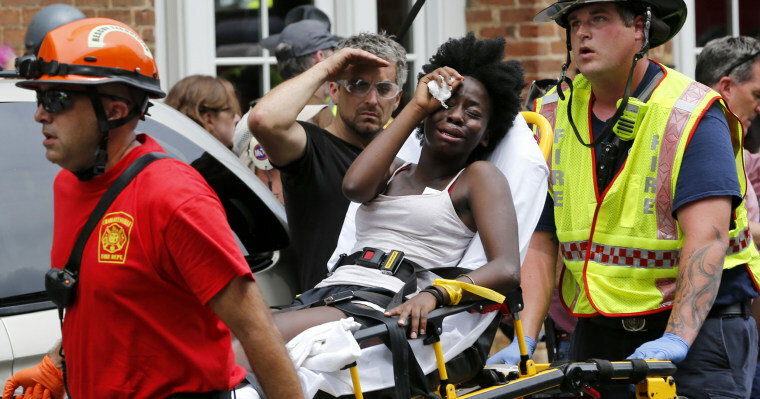 A car plowed into a crowd of counter-protesters after a white nationalist and Alt-Right 'Unite the Right' rally devolved into rioting. Hundreds of white nationalists, neo-Nazis and members of the "alt-right" march down East Market Street toward Lee Park during the "Unite the Right" rally on August 12, 2017 in Charlottesville, Virginia. After clashes with protesters, police said the rally was declared an unlawful gathering and people were forced out of Lee Park, where a statue of Confederate General Robert E. Lee is slated to be removed. 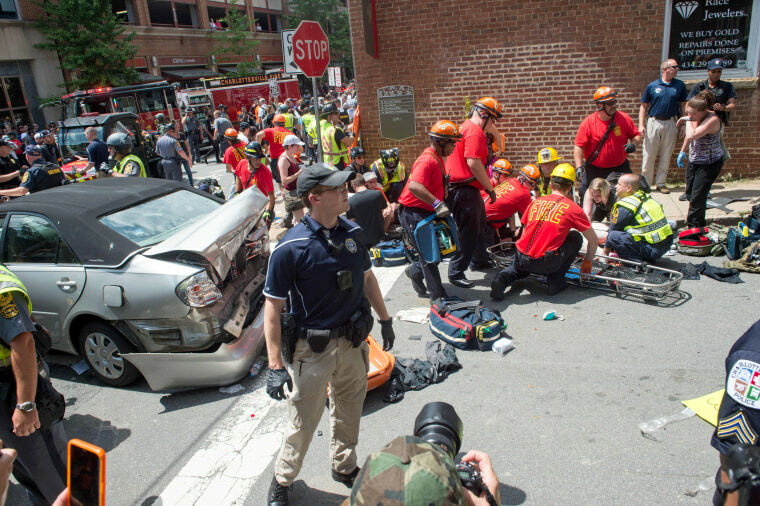 One person was killed and at least nine others were injured after a car plowed through a group of counter-protesters who were demonstrating against the alt-right and white nationalist rally. A man makes a slashing motion across his throat toward counter-protesters as he marches during the "Unite the Right" rally. Rally attendees dressed in body armor and combat weapons evacuate comrades who were pepper sprayed after the "Unite the Right" rally was declared an unlawful gathering by Virginia State Police. Virginia State Police Troopers stand near a statue of Robert E. Lee. White nationalist Richard Spencer (C) and his supporters clash with Virginia State Police in Lee Park after the "Unite the Right" rally was declared an unlawful gathering. Protesters clash with counter-protesters as they enter Lee Park during the "Unite the Right" rally. A man throws a newspaper box during clashes between counter-protesters and demonstrators at a white nationalist and “alt-right” rally at the entrance to Lee Park. Rally attendees exchange insults with counter-protesters as they attempt to guard the entrance to Lee Park. Pepper spray is used between protesters and counter-demonstrators near the entrance of Lee Park. A small group of white nationalists, neo-Nazis and members of the "alt-right" face off with Virginia State Police in front of the statue of General Robert E. Lee. A man wears a 'Make America Great Again' hat during the "Unite the Right" rally. White nationalists, neo-Nazis and members of the "alt-right" exchange insults with counter-protesters as they attempt to guard the entrance to Lee Park. 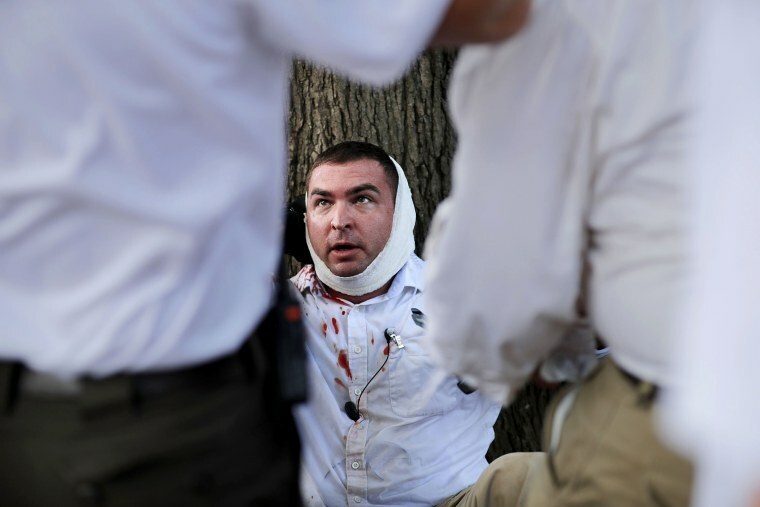 A man is cut below his eye during clashes with counter-protesters at Lee Park after the "Unite the Right" rally was declared an unlawful gathering. A counter demonstrator uses a lighted spray can against a demonstrator at a rally of white nationalist, “alt-right” and other groups at the entrance to Lee Park. Battle lines form between demonstrators at a white nationalist and “alt-right” rally and counter-demonstrators at the entrance to Lee Park. Demonstrators at a white nationalist and “alt right” rally clash with counter-protesters as they attempt to guard the entrance to Lee Park. Two people attending a white nationalist and “alt-right” rally take refuge in an alleyway after being hit with pepper spray. Police in riot gear push demonstrators at a “Unite the Right” rally out of Lee Park. A man hits the pavement during a clash between demonstrators and counter-protesters at a “Unite the Right” rally. A man has his bloody head bandaged by demonstrators at a white nationalist and “alt-right” rally in Lee Park. Alt-right demonstrators walk through Charlottesville. 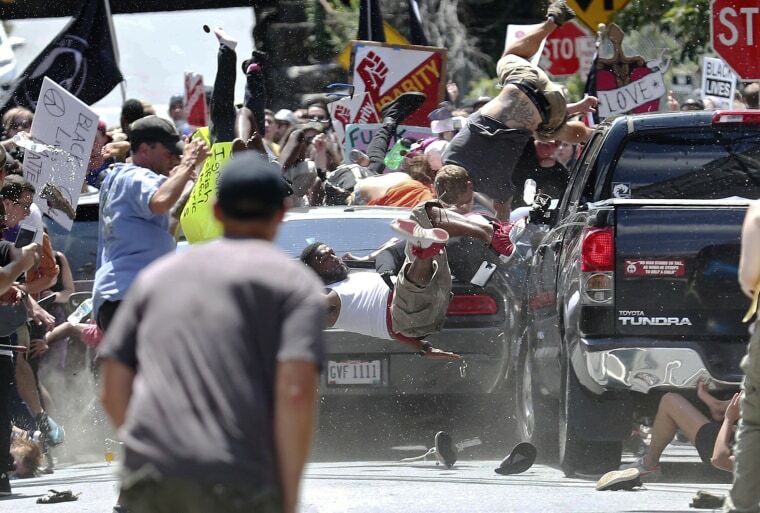 A vehicle drives into a group of counter-demonstrators at a white nationalist rally in Charlottesville, Virginia, on Aug. 12, 2017. People receive first aid after a car drove into a crowd of protesters. Medics and first responders aid protesters who were hit by a car that drove into a crowd at the rally. 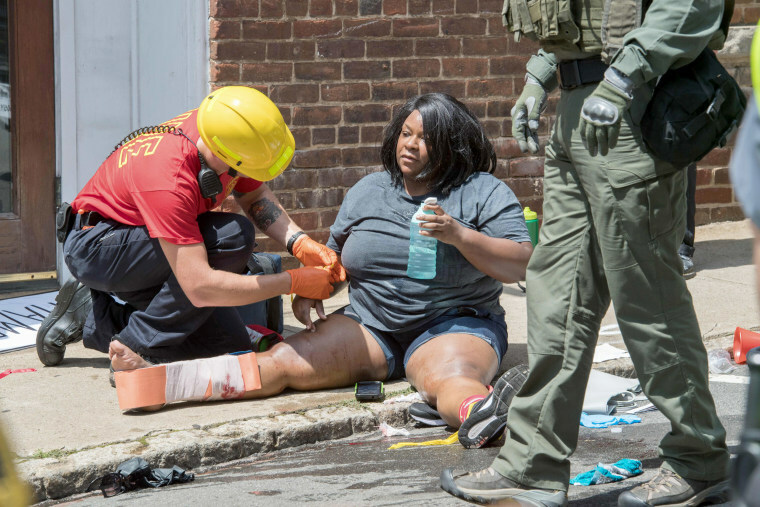 Rescue personnel help an injured woman after a car ran into a large group of protesters. 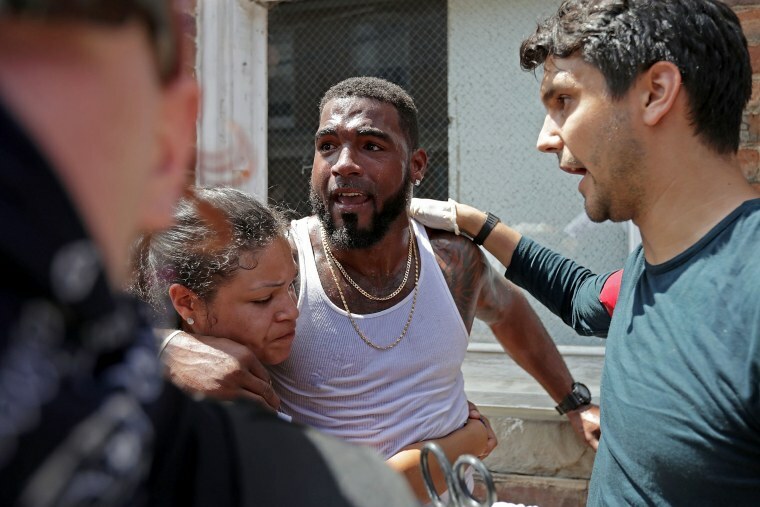 A woman who was injured when a car drove through a group of counter-protesters is helped. 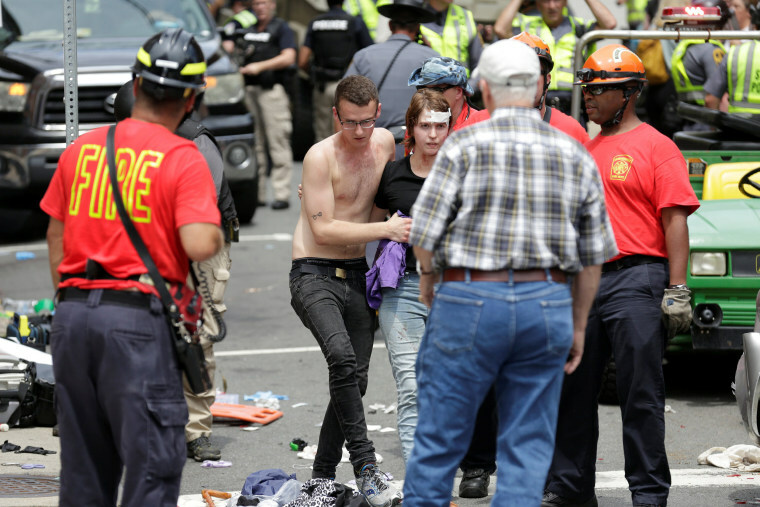 Rescue workers and medics tend to people who were injured when a car plowed through a crowd.